Dubai, the crown jewel of the United Arab Emirates, is known around the world as one of the most expensive, lavish, and fashionable cities known to man. People go to Dubai to embark upon shopping sprees, or to hit the city and party through the night, or to behold the wonders of some of the most astonishing works of modern architecture in the world. Dubai also features the world’s tallest skyscraper, the Burj Khalifa, rising high at 830m. If you go to Dubai, then it is an absolute must for you to stay at a luxury five star hotel, there’s really no other way to explore the city. 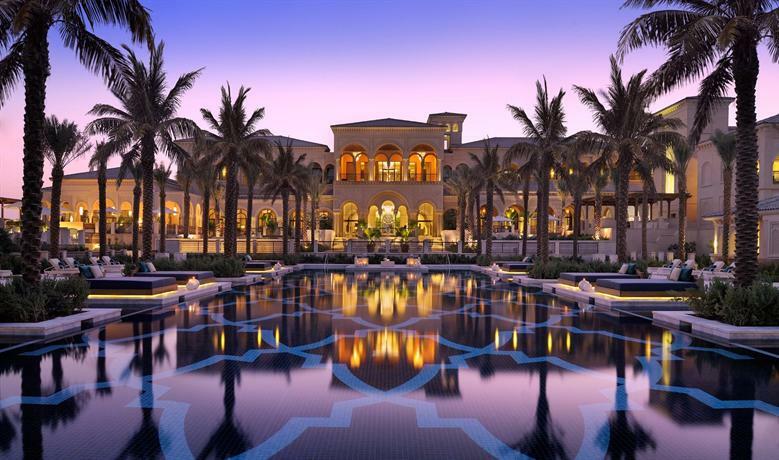 Below we’ve listed out the top 10 luxury hotels in Dubai. The Burj Al Arab is the most expensive luxury hotel on this list, and that spot is well deserved. The sheer uniqueness of this hotel is evident from the moment you first set eyes on it as it’s fashioned in the form of a giant sail rising over a thousand feet in the sky. To that end, the hotel has been created on a man-made island, which is only connected to the mainland by a causeway. It is a grand feat of modern architecture. During the nights, the hotel is lit up in various different colors that reverberate through the sail-like structure of the hotel. This sense of luxury and opulence is carried well into the interiors as well, with the atrium being surrounded on either side by towering golden pillars. The suites feature elaborate stairways made of marble and gold, and the beds are positioned on rotating pedestals so that you can take in a 360 degree view of the city. As far as the location is concerned, it’s 15 kms and 25 kms from Downtown Dubai and the Airport, respectively. However, it does feature other attractions in close vicinity, such as the Wild Wadi Waterpark, which is right outside of it, and the Madinat Jumeirah, which is a dining and entertainment complex rolled into one. Located on the western portion of The Palm, this boutique hotel is ideal for those who value sheer beauty and charm, but also peace and quietude. You can travel down to main Dubai via taxi, which takes about 30 minutes. However, the locational inconvenience is worth it when you take into consideration the unhindered view of Dubai Marina and the Jumeirah Beach Residence waterfront, which only residents of this luxury hotel are offered. The hotel favors a sandstone colored palette and is designed in the Moorish and Andalusian stylings, with lots of sharp geometric patterns in the design, along with extravagant fountains, pavilions, and other similar features. Despite the sheer grandness of this hotel, it feels rather like a boutique hotel with just 90 rooms, and four additional villas surrounded by lush greenery. 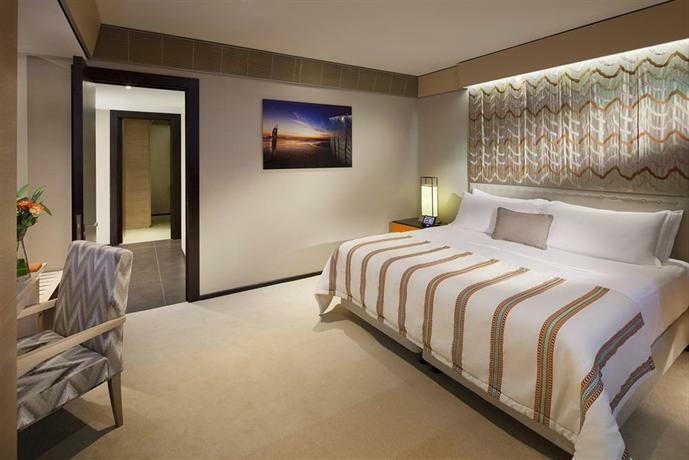 However, all of these rooms are some of the largest rooms offered by any luxury hotel in all of Dubai. All of the rooms, without exception, have their own private balconies and terraces, and the suites come with their own private plunge pools as well. The rooms are designed with a cream and bronze color palette, along with a rich dark wood aesthetic. The bathrooms are tiled in marble from Italy and Spain, and they feature separate installments for rain showers, freestanding bath, and the availability of luxury toiletries. The hotel also has a French fine-dining restaurant featuring staff members who have been handpicked from some of Paris’ leading Michelin Starred restaurants. 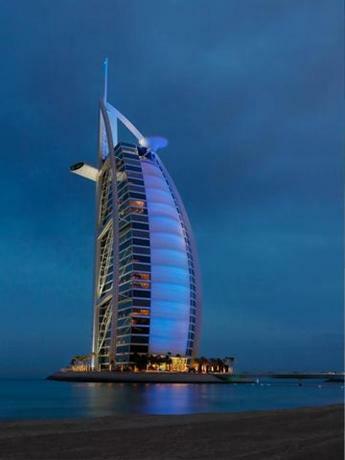 This luxury five star hotel is located quite close to Burj Al Arab, on the beach across from it. The location is quite fortunate because you’re within 10 minutes of walking distance from Madinat Jumeirah, which is one of the most famous and extravagant shopping centers in all of Dubai. This 26 storey resort was created back in 1997, and it has been designed in the shape of breaking waves, perhaps as a compliment to Burj Al Arab. The design is sleek and charming, though there's nothing about it that “stands out” as such. However, one can appreciate the fact that each and every single room has a sea and Burj Al Arab view. The hotel is designed in a sleek and modernist aesthetic with several amenities such as the presence of six on-site swimming pools and a whopping 21 restaurants to choose from. As such, you can be assured that whichever part of the world you come from, whichever part of the world you’d like to taste, all of it is made available to you. For instance, if you have a hankering for North Indian food, you can head on over to Naya for some delightful butter chicken or other similar dishes. There are also restaurants offering a complete English breakfast, and those that serve the British pub fare, and many other outlets you can try out. 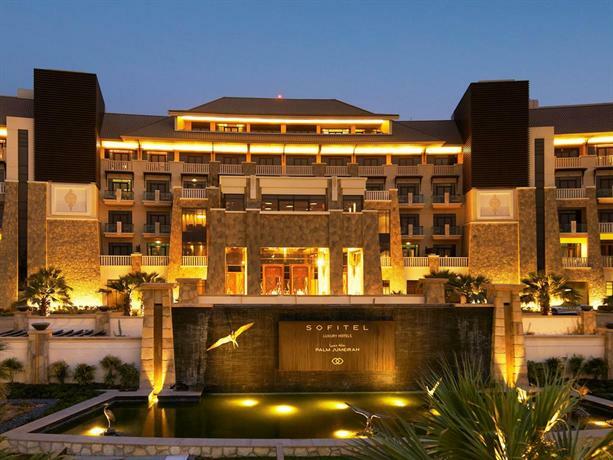 This luxury hotel is located centrally in Oud Metha, which isn’t either the most fanciful or most exciting location in Dubai, however it’s really well connected and is perfect for guests who prefer a little quiet and solitude. In the vicinity, you can head over to the Sheikh Zayed Road malls, and you’re also well within walking distance of the Financial District of Dubai. Creekside Park is an attraction which is close to the hotel, and it is also well connected to the airport which is just 15 minutes away. 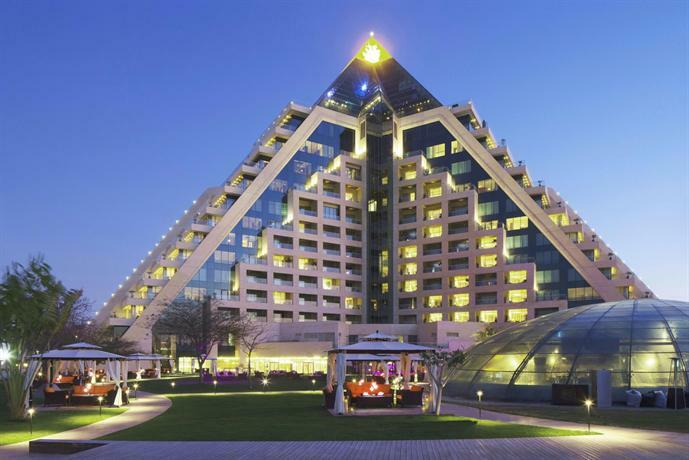 The hotel has an Egyptian inspiration and is shaped like the pyramids. As such it’s not particularly original and surely won’t appeal to popular interests, however the interiors more than make up for the drab exterior by being ornate, intricate, and extravagant with ottoman-style sofas and other furnishings that will take you back to ancient Egypt. The rooms aren’t as heavy on the theme and all guests are offered a 24/7 butler service. One of their most contemporary-looking rooms is the Penthouse Suite which features some pleasing Oriental accents. Furthermore, the hotel features a lot of handcrafted details, such as the mashrabiya technique used on the doors and shutters of bathrooms. In addition to this, all the rooms are extremely spacious with their own private terraces. The smallest room here is still 70sqm. The staff of the hotel is outstanding, they’re clear, efficient, and extremely discreet. This luxury world renowned hotel made in the name of the famous fashion designer is located in the cultural heart of Dubai — Burj Khalifa. The boutique hotel occupies several floors in the iconic building, is connected well to the Dubai Mall, and its view can boast sights such as the Dubai Fountain, Dubai Opera House, and Souk Al Bahar. If you’d like to while away your time at a particularly trendy neighborhood, you can easily access Mohammed bin Rashid Boulevard, which is the prime spot for trendy cafes, restaurants, and some great luxury car watching. 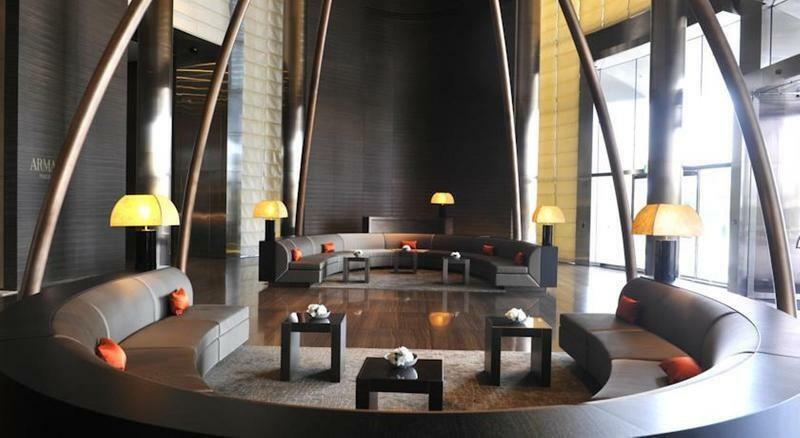 The hotel has been designed by Giorgio Armani himself, and as such it is typically chic and minimalist in style. The design of the hotel features bright lighting, natural and neutral shades, and clean lines, all of this adds to the charming and dignified aura of the hotel. The designs feature Eramosa marble floors, and the flower arrangements are prohibited from ever displaying more than two colors in a single vase. All the guests are also given their person “Lifestyle Managers”, which is really a more sophisticated means of saying Butler. This can make your stay at Dubai entirely effortless, trusting that your Lifestyle Manager will take care of all your needs even before you’ve thought of them. Additional amenities include an arrow-shaped pool, a luxury spa, sun trap terrace, and soothing ongoing music that helps minimize the sound of constant construction which is really just white noise to Dubai by now. 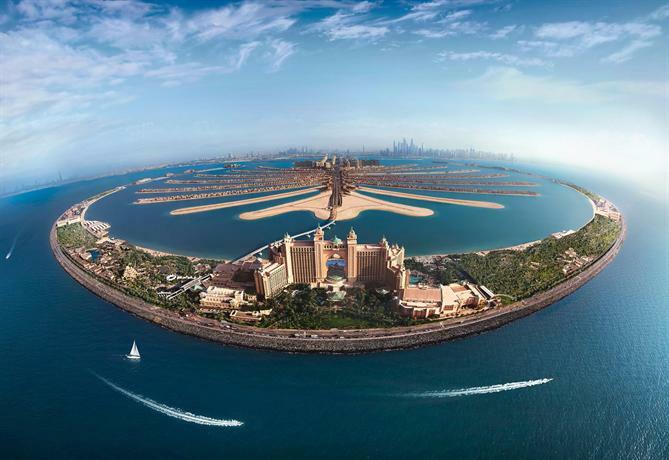 Atlantis, in the centre of The Palm, is iconic enough to be a tourist attraction in itself. As the name suggests, the hotel is built along the theme of the fabled lost underwater city, and as such the general color palette of the hotel consists of cool-blues and sea-greens. 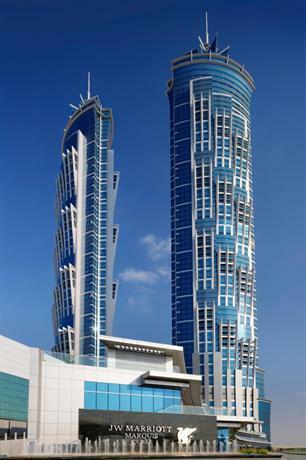 The two towers of the hotel are connected by the Royal Bridge Suite, which is one of the most sought after suites in all of Dubai. Even the interiors of the hotel have been designed in keeping with the general theme, with shell-patterned rugs, lights that look like oysters and clams, and doorknobs that look like fishes. Some guests find this decor to be simply charming, while others may also find it to be an overkill, depends on your own personal aesthetic sense. This luxury five star hotel is located right on Jumeirah beach itself, and you can visit the Burj Khalifa skyscraper by simply driving for about 15 minutes. The boutique hotel has a baby-pink aesthetic and color palette, with gardens blooming with exotic flowers, orchids, and birds. All the guests are also given access to swimming pools and their own personal butlers, who are just a button’s click away. 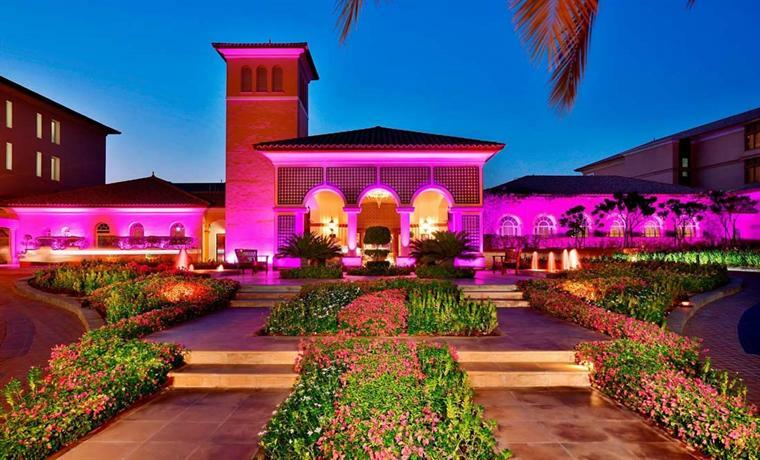 This luxury multinational hotel is located at the very heart of the financial district of Dubai, and is quite close to Gate Village, which happens to be the sprawling and buzzing hub of Dubai’s art and cultural life, replete with a string of modern art galleries and charming restaurants. The hotel itself is quite a mixed bag of architectural influences — the exterior features a limestone façade which is immediately noteworthy; meanwhile, the courtyard features waterfalls and fountain installations along with lush greenery; the lobby has an Art Deco aesthetic leaning with ornate chandeliers hanging off the ceilings; and the artworks that line the lobby walls are mostly modernist and contemporary. However, this mesh of influences works entirely in its favor. 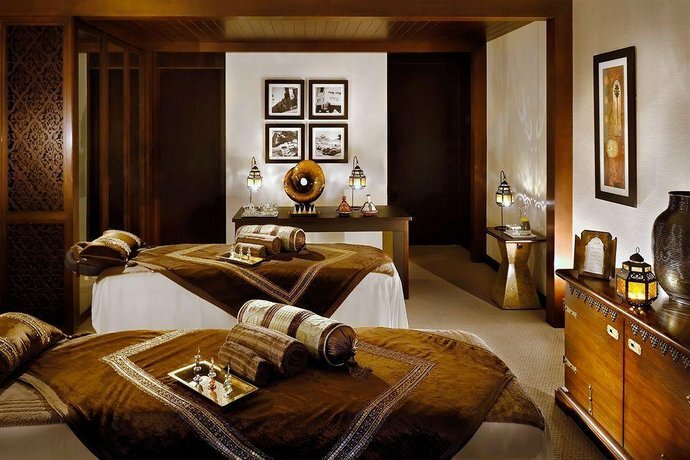 This boutique hotel is located near the “Culture Village” of Dubai, and is only a 15 minute drive to the Dubai Mall. The hotel is pegged as an ode to the architectural designs of 16th century Italian palaces. The interiors of the hotel are most fascinating with Czech chandeliers, marbled floors and countertops, and gilded columns. The rooms come in four major color palettes — salmon, beige, turquoise and blue — and you have the ability to choose which one you prefer. Furthermore, the furnitures used to deck the halls of the hotel are taken straight off Versace’s collection. 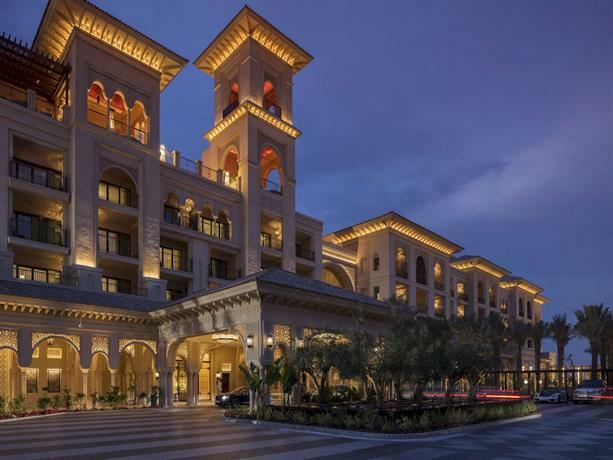 This luxury hotel is located in one of the newest districts of Dubai, even though it is fondly called “The Old Town.” It is well connected, with prime attractions like the Dubai Mall and Burj Khalifa being just a short walk away. The general aesthetic sense of the hotel is minimalist and modernist, however it does feature a few oriental and middle-eastern flourishes in the form of the ornaments seen in the lobby and galleries. The rooms are quite modern with large flat-screen TVs and complementary WiFi connections. 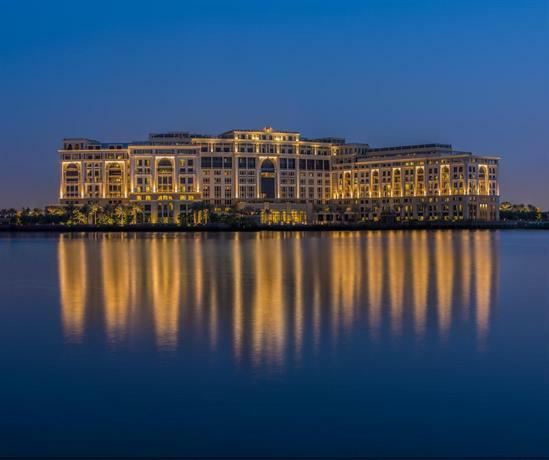 This luxury hotel is located on The Palm’s West Crescent, and is right next to Jumeirah Zabeel Saray. The hotel feels like it’s very much in sync with nature, with a luscious garden in the back of the hotel, right next to the sea. The architecture is classical European, which definitely makes this a unique hotel in Dubai. The hotel is beautiful and serene, and has a total of 240 rooms and suites. The general color palette of the hotel is blue, cream, and beige, and as such the entire hotel feels vibrant, bright, and feels like an extension of the beach itself. 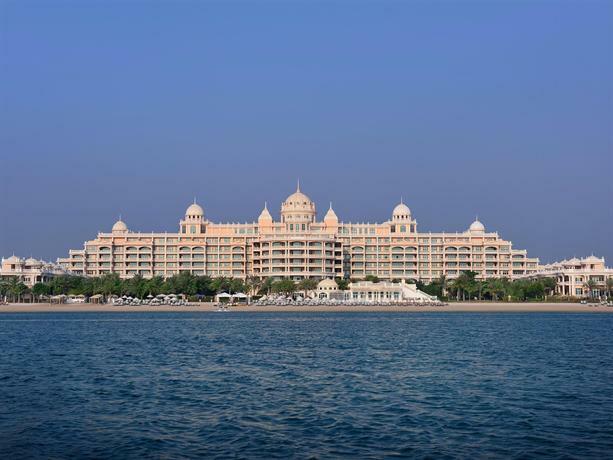 This is yet another lovely luxury hotel located on the beautiful island of Palm Jumeirah. The hotel features a total of 361 rooms, all of which are very well equipped with all modern amenities such as WiFi, smart TVs, and even Bose surround sound systems. If you check into one of the suites, you can even avail of a personal kitchen, which is a great addition for families with kids. And if you get yourself a villa, then you can even have access to a private pool. The hotel is popular amongst families with little kids because it also offers babysitting services, in addition to a family-friendly vibe. 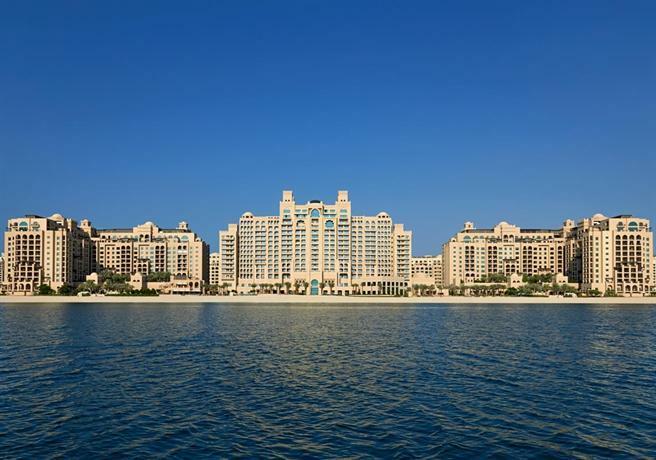 This boutique hotel is located on the man-made island Palm Jumeirah. You can reach the Dubai Marina within 10 minutes by taxi, and in 15 minutes you can reach the JBR beach as well. If you’d like to go to other attractions such as The Dubai Mall and Mall of the Emirates, then you can even hop aboard the free Shuttle Bus. The general color palette used by the hotel is a lovely and refreshing fusion of sand brown, beige, and aqua blue. Furthermore, there are certain handcrafted details in place that also give this hotel a wonderful Arabian feel, with the presence of Mashrabiya woodwork and brass lanterns. This luxury hotel isn’t in the immediate vicinity of any tourist attractions, however it’s equidistant from both the old and the new Dubai. If you want to get around the city, then you can either walk to the metro station, which will take you 10 minutes, or you can hitch a ride on a taxi. A ride to the Creek will take you approximately 20 minutes. The general decor of the hotel is classy and subtle, however they do have some magnificent and attractive features in place as well, such as an art installation featuring 1300 glass bottles. Depending on your personal perspective, this subtle yet creative spirit of the hotel might make up for its poor location. 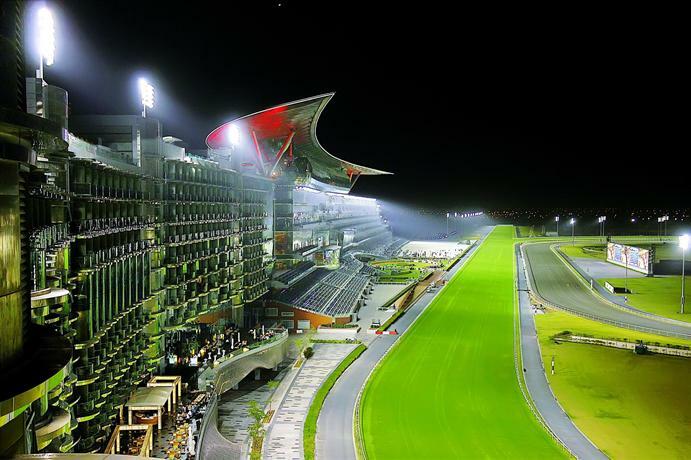 This luxury hotel is expertly placed to face the Meydan Racecourse, which is the site for Dubai’s World Cup event. Some of the rooms even boast a full view of Burj Khalifa. The hotel has balconies and terraces of rooms designed in such a manner so that externally they resemble the gentle cadence of an ocean wave. The color palette of the hotel might seem erratic, but it mostly comprises strong bold colors being complemented with gentler, more subtle shades. For instance, a shiny black piano might be offset by furniture that is gentle lilac in shade. This makes the hotel feel quite well balanced.